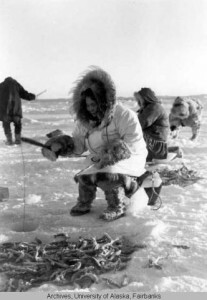 Women hooking tomcod on the ice, Point Hope, Alaska, circa 1955. UAF-2001-129-44, Mary Cox Photograph Collection, University of Alaska Fairbanks Archives. Alaskana is an annotated listing of recent publications on the North. Until 2009, it was compiled by Bruce Merrell, Alaska Bibliographer at the Z. J. Loussac Library in Anchorage. Since then other Alaskan librarians have developed the lists. Select a link from below to view the listings.